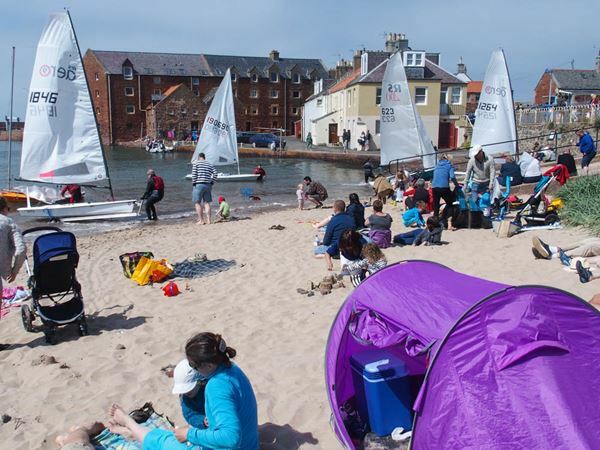 With most keen RS Aero travellers on the south coast at the 70 entry UK Champs it was great to also still see five RS Aero owners out at the East Lothian YC Regatta at North Berwick in Scotland were they have a nice fleet of RS Aeros emerging. East Lothian play host to the Scottish Champs on 3rd Sept (Round 4 on the Northern Circuit) and we also look forward to visiting this popular Scottish venue for our UK Nationals in 2019! Saturday 4th June continued the recent spell of easterly weather. Early mist soon burned back leaving a sunny day with a cool north easterly of 15-20 kts, and as usual in these conditions, a big swell to go with it. 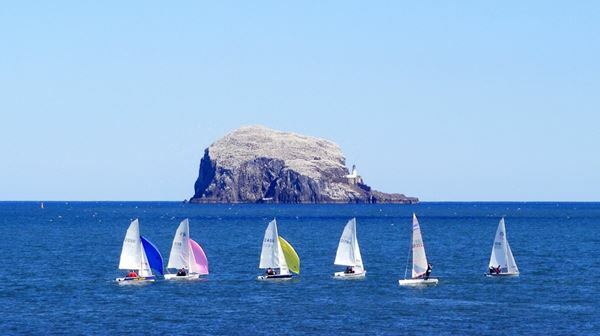 After a slight delay the 100 or so boats, 5 RS Aeros among them, left the beach with the asymmetrics heading east between the islands of Craigleith and the Bass Rock, the singlehanders heading west towards the Lamb. Prior to the racing the RS Aero sailors discussed rig choices; with a 15-20kt breeze on Saturday and much lighter forecast for Sunday, agreement was reached to sail 7m rigs on Saturday and all change to 9m rigs for Sunday. The long run down to the start gave the pond sailors a chance to get used to the North Sea swell. PRO Bill Roberts set the first race as a simple triangle with a relatively short windward leg. Local sailor Iain McGonigal pulled away up the first beat and held his lead through the long reaches in the waves. He continued to slowly increase his lead through the second lap finishing comfortably ahead of Ed Storey from Yorkshire Dales Sailing Club. ELYC sailor Steve Fraser was third with Ed Reeder 4th and David Farmer 5th. Ed S had now got used to the waves, and in the second race held the early lead up the first beat (following a fine port-hand flyer at the start), followed closely by Iain McGonigal. A gear failure at the top of the beat resulted in Iain retiring from the race and going ashore to find a spare rudder assembly. Ed continued to build up his lead followed by Steve Fraser and Ed Reeder, Steve winning out to take second from Ed. Having managed to borrow a rudder assembly (thanks to Robbie Lawson), Iain returned in time for the third race. A close battle once again ensued between Iain and Ed S, Iain just winning out. Sunday dawned with light winds as forecast, so the RS Aero sailors all rigged 9m sails. A very low tide led to an hour or so delay to launching. Once on the racecourse, Bill Roberts set the Aeros a trapezoid with an outer loop. Again battle was joined in race 4 between Iain and Ed, but unfortunately a clump of weed round the rudder saw Ed slip back to 3rd, with an improving Steve Fraser taking second. There was some cursing of rig choice as the wind built well beyond the forecast of force 2, edging up to 15+ knots during the last race. Iain and Ed attempted to outmanoeuvre each other up the left hand side of the course, while Steve and Ed Reeder found a favourable shift on the right. Steve, Ed Reeder, Ed Storey and Iain was the order at the first windward mark. It was still close at the first leeward but gradually Iain and Ed S pulled away. A sporting gesture by Ed S helped Iain to a win - crossing the finish line with a gaggle of Toppers Iain thought he had been given a finish however Ed, coming through a few seconds later, was told to race on and shouted to Iain to keep going for a third lap. Overall, a great weekends’ sailing in fantastic sea conditions. Iain and Ed’s rivalry is going with home advantage with Ed winning at the recent RS Aero Open at Yorkshire Dales SC, and Iain taking the honours at ELYC. Steve Fraser of ELYC was a close third with Ed Reeder fourth and David Farmer 5th. Thanks to Ed Storey for travelling up and we hope to see him again at our own Northern Circuit event in September. Congratulations also to Ed’s son Tom who won the Feva class!